If you're looking for a gift that's going to make that lady in your life (whether it be your wife, mother, sister, or girl friend) feel extra special, then one of these little gift of luxury will do just that. In my opinion, you can never go wrong with a cashmere scarf, because who wouldn't want to wrap themselves up in one on a cold day, and a great smelling candle will put a smile on any ones face. Speaking of face, make hers glow with this La Mer gift set, and these Sk-11 face masks will leave her feeling radiant. If she's been really good this year (hint hint Mike) a designer shoe, bag, or belt will keep her smiling all year long. Did everyone have a wonderful Thanksgiving, and do a lot of shopping this past weekend? I ordered some fun Black Friday and Cyber Monday goodies and can't wait for them to arrive. Speaking of, a lot of stores are continuing their sales through today, so it's not too late to grab those items that you have been eying. This off-the-shoulder crochet top is an additional 25% off until the end of today, making it only $34! You all know of my obsession with off-the-shoulder tops, but I'm also loving the crochet detailing making such a pretty blouse for the holidays. Also, the cinched waisted hides the food baby that I tend to get from all the indulging I do during the holiday season! This top would look great tucked into a skirt or paired with velvet pants for a holiday party, but I wore it with my black high rise jeans and studded heels for a date night with my husband. How cute is this wristlet? 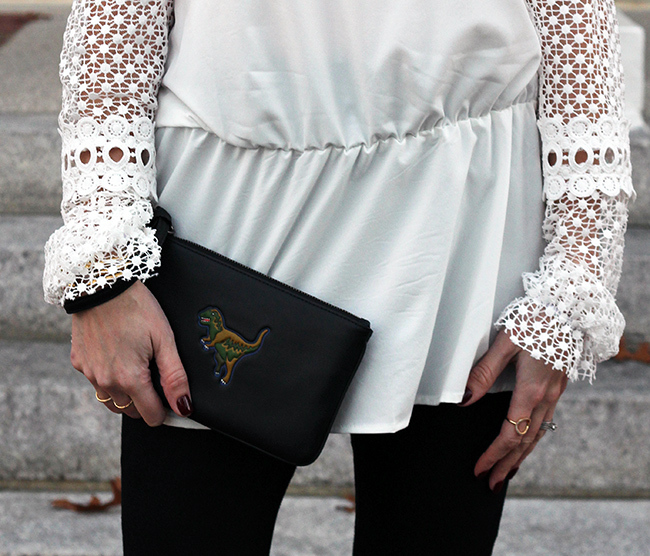 It's part of Coach's Rexy Collection, which has become very popular this holiday season. Although I'm not the largest fan of dinosaurs, I do find Rexy the Dino to be adorable. 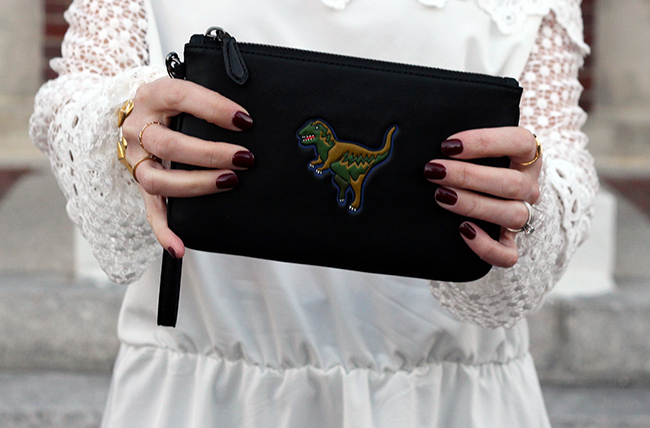 Plus, the twins love dinosaurs and get excited every time they see me using the wristlet. They begin to roar, which always puts a smile on my face. You can check out the Rexy Collection here, and if you know someone who loves dinosaurs, they make a great gift! Happy Black Friday! I hope everyone had a wonderful Thanksgiving. I am currently in Vermont enjoying the weekend with my family. There is over a foot of snow on the ground here, and it truly looks like a winter wonderland. The kids have been building snowmen, and the fireplace has been running, really putting me in the holiday spirit. Speaking of holiday spirit, today is the perfect day to start your holiday shopping. There are so many great Black Friday sales, so whether you're looking for a holiday outfit for yourself, or the perfect gifts for your loved ones, I've listed my favorite sales below. Speaking of sales, my complete look is discounted, and most everything is under $100! I recently added this Shein sleeveless coat to my wardrobe, and love how it pulls my outfit together. 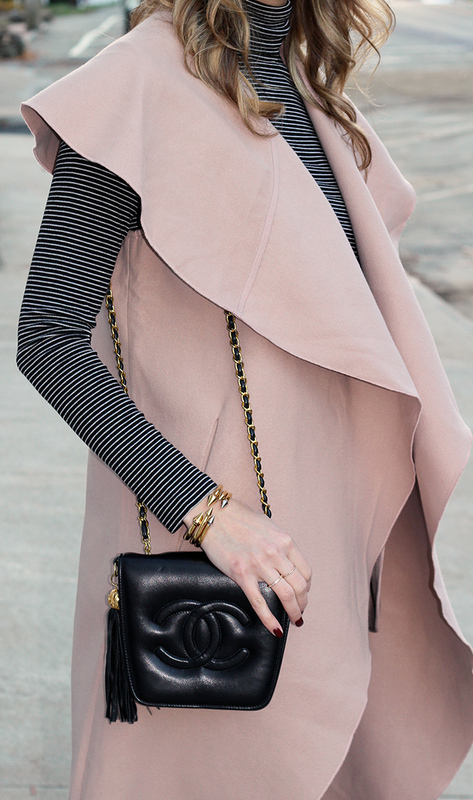 I had been wanting to add a sleeveless coat to my wardrobe for a while, and I love the waterfall drape of this coat. It's the perfect piece to layer over a dress, or pair with jeans and a tee. The best part is that it's under $25! 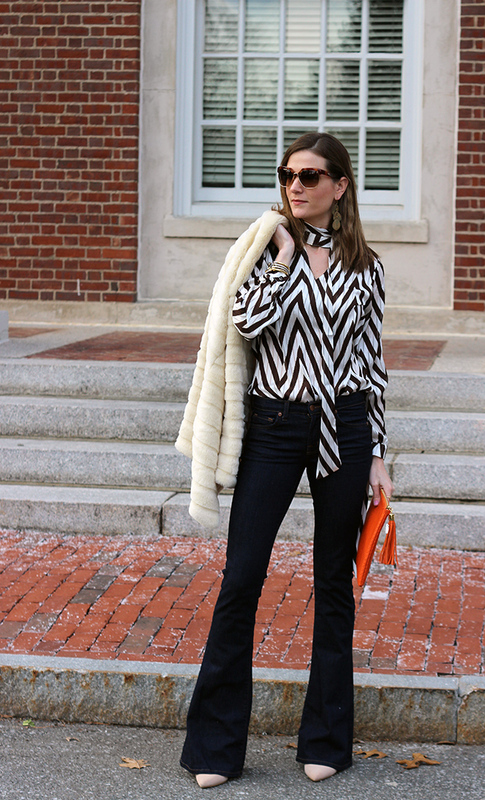 I kept my look classic by pairing it with a striped turtleneck (50% off), my favorite faux leather pants (under $52), and finished my look with block heels (only $75). Shein is offering free shipping on all orders, and a surprise gift with orders over $55 through Monday 11/28. I wish everyone a great weekend! Amazon: 30% off select clothing, shoes, jewelry, watches and more. Bloomingdale's: Buy more save more. Take 15% off when you spend $100- $199.99, and 20% when you spend $200 or more. And save up to 50% on select items. Express: 50% off everything and free shipping. J.Crew: 40% off your purchase in stores and online. Use code: HOLIDAY. Old Navy: 50% off almost everything online and your entire purchase in store. Revolve: Up to 65% off. Topshop: Up to 50% off select items. Crate & Barrel: 15% off full price purchases. 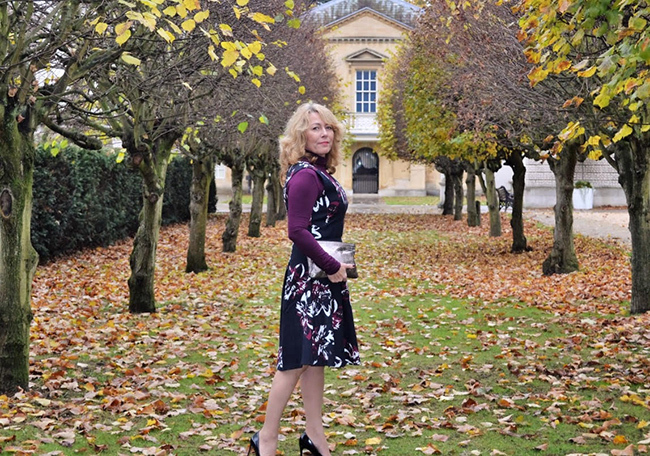 The feature blogger of the week is Laurie from Vanity and Me. I'm loving her floral fit and flare dress. Make sure to visit her blog and say hello. 9 Perfect Gifts For The Hostess + Thanksgiving Day Sales! 'Tis the season! The holidays have officially arrived, and this girl couldn't be happier. Not only do I love attending (or throwing) holiday parties, but between Thanksgiving, Hanukkah and Christmas, I spend a lot of time with my family, and nothing makes me happier. Along with the holidays, comes finding the perfect gifts for our loved ones, and in order to help you out, I'll be sharing my gift guides over the next couple of weeks. Today I'm kicking my gift guides off with nine perfect gifts for the hostess. I'm sure your calendar is starting to fill up with holiday parties, and if you're like me, you don't want to show up empty handed. Finding the right gift can sometimes be a challenge, so here are some great ideas for that hostess with the mostest in your life. One thing that I love when it comes to gift giving is adding a personal touch, and the easiest way to do this is with monogramming. I'm obsessing over this polka dot mug, and you can never go wrong with wine glasses for someone who is constantly entertaining. Serving dishes make another great option, and I can't get over the cuteness of this cheese board. Gourmet candies are perfect for those sweet toothed people in your life, and I love the idea of giving something that can be used on a daily basis, like this water bottle. Some of the most fun parties I've attended involve playing games, so a board game or pretty deck of playing cards is a fun idea. And one thing you can never go wrong with is a great smelling candle. 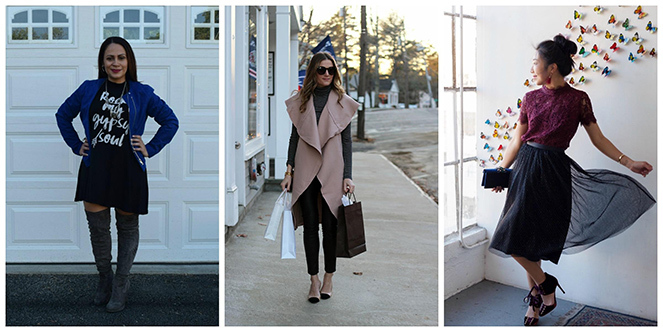 Still wondering what you're going to wear this week for Thanksgiving? (Which I can't believe is just four days away.) No need to fret, because I've got you covered. 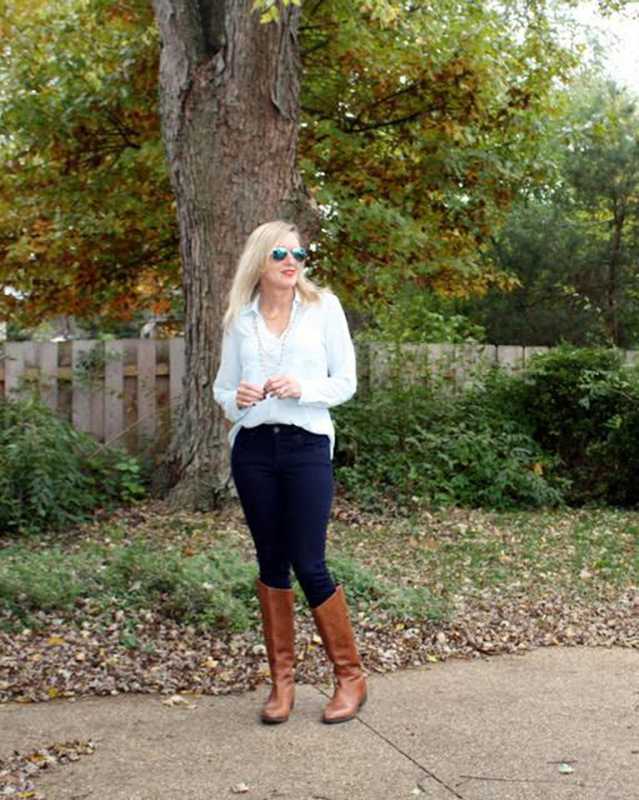 Whether your Thanksgiving dinner is a formal occasion, or a casual family gathering, I've got all the outfit inspiration that you need to put together the perfect look. 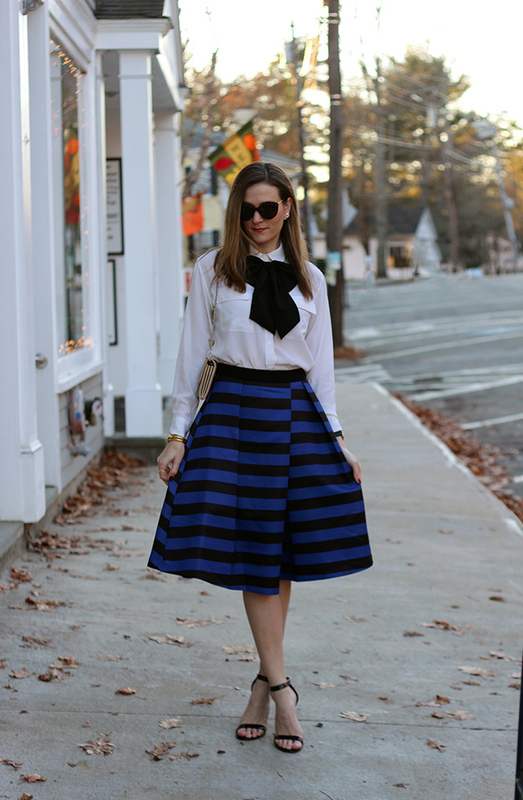 If your holiday is a formal celebration, I love the idea of wearing a dressy skirt with a bow blouse. 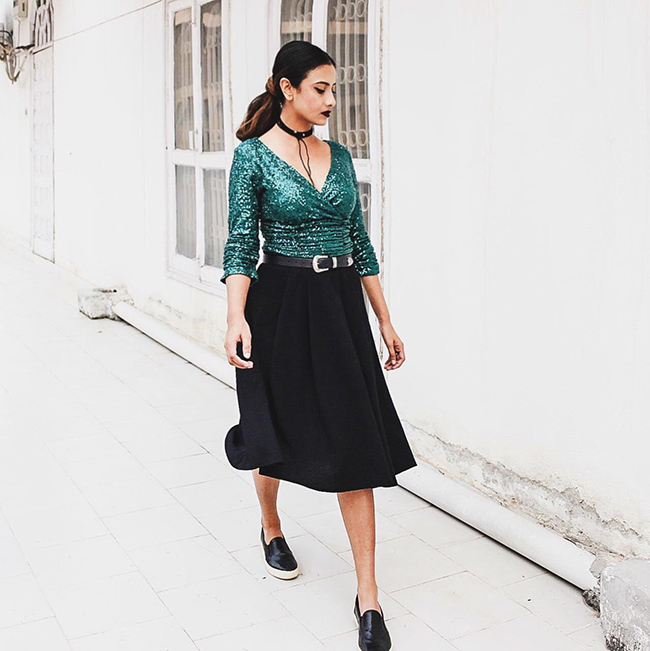 Pleated skirts are a must have this holiday season, and a party (full) skirt will always be my classic go-to. Pair it with a silk blouse, and add a bow tie, for a put together, fun, yet classic look. Another way to dress up for Thanksgiving is with a sweater dress, which I will be wearing this holiday. Not only do they look polished, but since you're basically wearing an oversized sweater, most are super soft and cozy. I'm obsessed with the fringe detail on my sweater dress, above, and will be wearing it this Thursday with tights an over-the-knee boots. If your Thanksgiving celebration is semi-formal, then again a sweater dress, or a pair of leather pants make a great option. Dress your leather (or faux leather) bottoms up with a blouse, or pair it with a chunky knit and statement earrings for a cozy, put together look. Plus, a lot of leather (and faux leather) pants tend to have an elastic waistband, which is perfect for those extra pieces of pie (tell me I'm not the only one who goes back for thirds)! For causal Thanksgiving get togethers, I love dressing up a pair of jeans. Even when I am able to dress casually, I still like feeling put together, so a dark pair of denim, and a dressy blouse is one of my favorite pairings. If you're looking to go for a more comfortable look, then a chunky knit, and lace up flats make a great option. Finish your look with a stand out pair of earrings, or statement necklace to add a little glam. Do you know what you'll be wearing this Thanksgiving? I'd love to hear your outfit suggestions! I love to shop. In fact, I love it so much, that I made it my job. However, when I am on the hunt for an item (e.g. 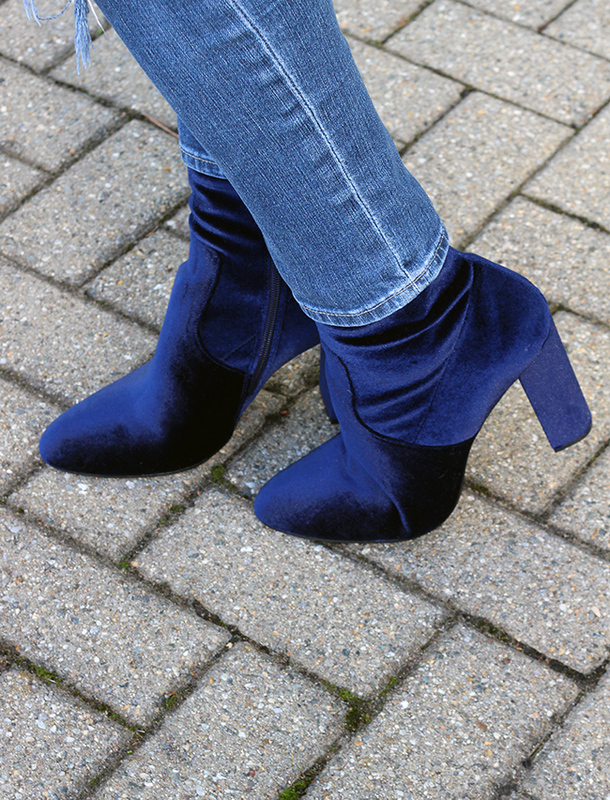 velvet booties), but not sure which specific pair I want, researching can take up a lot of time. Time that I'd rather spend playing with my kids. I want to find the best product at the best price, and jumping from one website to another can be a bit tedious. Thankfully, I was introduced to Octer, an online marketplace that does all this work for me, and it has changed the way I shop. With over 200 stores in its database, Octer and will give you search results from different stores all in one place. Whether you're on the hunt for the perfect red lipstick, the chair that will finish your living room, or in my case, a great pair of velvet booties, Octer will give you the options from different stores to compare. You simply type in the product that you're looking for (you can narrow it down by price) and voila, the options are right in font of you. Since I was on the hunt for a pair of velvet boots, I decided to give it a test. Not only did Octer show me a bunch options all within my price range, but it pulled up velvet boots from stores I would never think to check. I was debating between two pairs that were in my search results, and decided to go with these Steve Madden velvet beauties since there were so many great reviews on them. I don't think that I could be happier with my choice! I decided to keep my look simple by wearing all blue, and love how the different textures looked paired together. 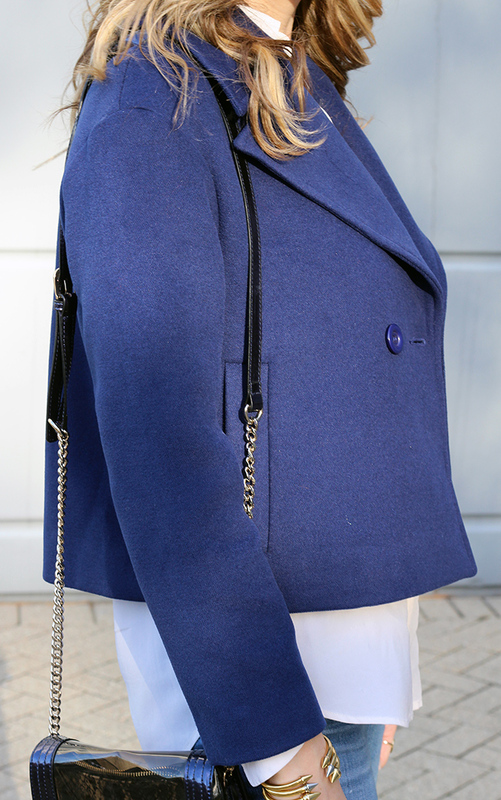 I'm also quite obsessed with this blue coat! I wish everyone a great weekend. We have two feature bloggers this week! Jill from Doused in Pink and Chichi from The Style Tune. I'm loving Jill's classic fall look, and Chichi's tips for styling sequins. Make sure to visit these beautiful ladies blogs and say hello!